And what are those big policy differences? In the WSJ article, Taylor spends a lot of time making a general case for "economic freedom," but names only one concrete policy difference between Reagan and Obama: Reagan enacted permanent tax cuts, while Obama enacted temporary tax rebates (in the ARRA). Taylor argues that Reagan's permanent tax cuts represent policy based on predictability and stability, while Obama's policies represent short-term, unreliable interventions. This is a very standard intellectual-Republican narrative of economic history. Which, again, does not mean it is wrong. But I do see some big problems with Taylor's analysis. Problem 1: Reagan's permanent tax cuts were enacted in early 1981, before the steep recession. This means that any effect that those tax rates had on the 1983 recovery had to have come not from the policy change, but from the low tax rates that were in place. However, in 2010, thanks to the Bush tax cuts, stable permanent long-term income tax rates were lower under Obama than they were under Reagan. If low permanent tax rates caused a rapid recovery in 1983, why didn't even lower permanent tax rates cause a rapid recovery in 2010? In other words, if the 1981-2 recession was fundamentally the same kind of event as the 2008-9 recession, then Taylor is concluding that Obama's temporary tax cuts (or other actions, such as saying bad things about "business") substantially prolonged the current slump. I suppose that is possible - it's a claim that many Republicans have repeated - but it seems like a difficult case to make. A lot harder of a case, in fact, than simply saying "Reagan's policies were better than Obama's." This many months after the start of the Great Depression, the British economy was rapidly converging back to its pre-depression level of production under Chancellor of the Exchequer Neville Chamberlain's policy of using stimulative policies to restore the price level to its pre-Great Depression trajectory. So if you want to ascribe economic outcomes to broad differences in economic policy, why only look at the Reagan years? Why not look at the Depression? And why look only at the U.S. instead of at other countries as well? Problem 3: The 2008-9 recession does not seem very comparable to the 1981-2 recession. For one thing, the early 80s recession immediately followed (and, most believe, was precipitated by) a huge hike in interest rates by the Federal Reserve (which was trying to beat inflation). That meant that as soon as rates were allowed to fall, the force that had spiked U.S. GDP growth would be removed. In contrast, the 2008-9 recession occurred during a period of historically low interest rates, which were dropped to zero shortly after the recession began. This left the Fed without its usual method of boosting GDP growth. Even more importantly, the difference also indicates that the "shocks" that caused the two recessions were fundamentally different - a policy shock in the case of the early 80s recession, but some other kind of shock in the case of the 2008-9 recession. In other words, I think this simple standard Republican narrative does not fit the facts. It is tempting, especially for politically conservative economists, to conclude that Reagan's tax cuts made everything about the U.S. economy awesome, and that something done or said by the left-leaning Obama made everything go wrong. But that conclusion just doesn't square with the evidence that we see when we look out the window. I think a more complex narrative is needed. Update: Paul Krugman points out that Reagan raised taxes in 1982. Which means that A) Reagan's 1981 tax cuts were not quite as predictable, stable, and long-term as Taylor claims, and B) according to Taylor, this Reagan policy should have hindered the 1983 recovery. Thanks for this. I am a market analyst in the UK and have followed the criticisms of John Taylor that you and Paul Krugman have made. It is clear that, although JT may be a serious economist in his own field, he is not a serious commentator on the economic situation in general. I have tuned him out. Why do you treat someone who is behaving as a partisan hack as an academic worthy of respect, in any way? 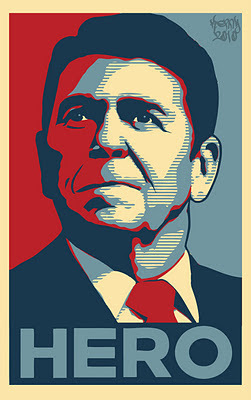 Do not show disrespect for the Great Reagan, young Padawan. I agree with JLD. This is your very typical, garden variety and very old partisan hackery that conservatives have periodically pedaled since St. Ronnie left office. The supreme awesomeness of Reagan tax cuts (um, never mind that he raised them - hey look, a squirrel) is, to the brain dead right, is as clear as the nose on your face. Trouble is, that view is complete and total horse manure. To me it is truly sad about how conservatives treat Reagan. By force of personality he did a great deal of good for the Country. His "policies" had nothing to do with his success. The man should be honored by everyone for what pleasantry and energy and optimism can accomplish. The lies that are now told about him to rationalize greed and mendacity . . .
Perhaps the answer is that Obama's income tax rates, compared to Reagan's, are far too low to generate strong economic growth. Something else worth pointing out is economic growth following the recession in 1980 (Jan 1980 to June 1980). There was a V shaped recovery from that recession as well. So it has nothing to do with Reagan. It's simply a fed interest rate hike and then cut. Problem #1 is addressed by focusing on 'stability' regardless of the short-term time path of rates, the zeitgeist was toward lower marginal-rates. The same is not true now. A lot of people think (and thought) that the Bush rates will be repealed and that rates will go even higher than that. Regarding the British reference in Problem #2, you need to consider that one factor revealed by an Austerity program is how much of the government's contribution to GDP was false. Why is it false? Because something that should have been classified as a transfer payment was treated as real output. Once the transfer ends, there is little boost to real output elsewhere but the mistaken entry drops out of the national accounts and GDP looks to shrink. But it is not GDP that is shrinking, it is the prior period GDP statistic that is wrong.